Canter's Deli is officially back, at least in my mind, to its original status. That status was a classic California deli, a landmark, that had opened a version on the Las Vegas Strip. When it first arrived at TI, it was pretty exciting. I don't know what happened between then and about a year ago, but that's when I returned for another taste of pastrami to find that all was right in the world again. And I've been back, and things are still right. Way right. I can't pick a top pastrami in Vegas. The choices are this joint, Carnegie Deli (which is one casino over at The Mirage) or Bagel Cafe. But this creation, the Viva Las Vegas, is officially my favorite sandwich at Canter's. 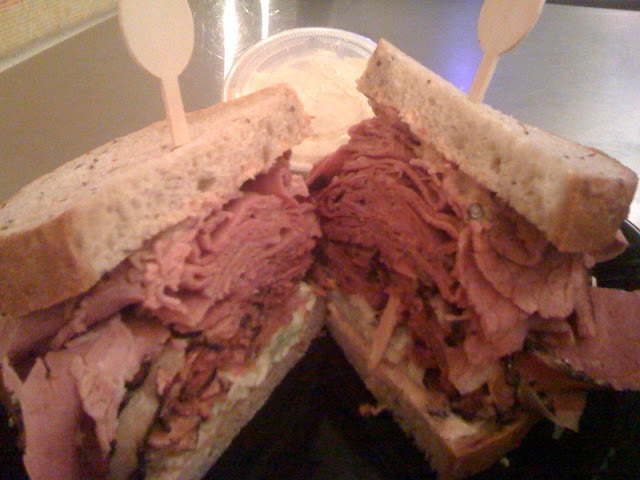 There's plenty of that spicy, juicy pastrami, and an equally tremendous stack of corned beef. Tasted separately, there is a distinct difference as the corned beef is more dense, beefy and salty, while the pastrami is, of course, peppery. But together in one mighty mouthful, everything swirls together in a decadent way. These are the two deli meats that the L.A. Canter's built its reputation on, so it's not a surprise that this sandwich is a winner. Also on these terrific slices of rye, there is some Swiss cheese, just enough creamy coleslaw to cut through the salt, and a barely there dab of Russian dressing. I recommend you add a significant wipe of whole grain, spicy Beaver brand mustard, which will overpower the kinda sweet dressing and legitimize this sandwich as a true deli masterpiece. Just cuz it's on the Strip doesn't mean it ain't real.